Located in the 4th largest city in the nation, the home of NASA, and "the energy capital of the world", KPRC Channel 2 is the NBC affiliate for Houston, TX. KPRC has always been an innovator as the first television station in Houston and the 12th in the nation. KPRC was the first in Houston to broadcast in color and the station that beamed Neil Armstrong's famous words "one small step for man, one giant leap for mankind" across the world. KPRC continues to innovate through communication advances and community partnerships, and their website Click2Houston.com was recently named the best website by the Texas Associated Press. Houston is the most diverse city in the US, and one of the fastest growing with three professional sports teams, world class dining, shopping and theatre. KPRC is proud to cover it! WDIV-TV is the NBC affiliate in Detroit, the market leader in news, weather and original local programming. Local 4 ranks in the top three NBC affiliates among the largest 40 markets nationwide. As the only TV station in the heart of Detroit, Local 4 is the Big Event Station partnering for huge community events like America’s Thanksgiving Parade and The Ford Fireworks. Ninety-five percent of Metro Detroiters watch Local 4 at least once a week and ClickOnDetroit.com is the most visited TV website in Michigan and usually ranks in the top three news and information sites for the state. Honored with Edward R. Murrow Awards, the NAB Service to America Award, Michigan Emmys and the 2014 Michigan Association of Broadcasters Station of the Year Award, Local 4 has always been and will continue to be an organization of firsts. Surrounded by palm trees and world renowned beaches is where you will find WKMG-TV News 6, the CBS affiliate in sunny Orlando, Florida. Scenery is not the only thing that makes News 6 special. WKMG is dedicated to bringing Central Florida’s nine counties information that matters to their lives. From original local programming, relevant investigative and consumer stories, and up to the minute breaking news and weather, News 6 thrives on sharing compelling, empowering stories with the community. As one of Central Florida’s preferred sources for local news and weather, WKMG is committed to providing that same content across every screen the viewer owns. That commitment is evidenced by their top-ranked, news breaking website clickorlando.com. News 6 is also home to a full service advertising agency comprised of WKMG employees who create multi-platform advertising campaigns for national and local clients. WKMG has earned numerous industry awards including the prestigious Edward R. Murrow and was the first Central Florida television station to broadcast live on air, signing on in July of 1954. Deep in the heart of Texas lies the famed River Walk, several military bases, The Alamo, and Graham Media Group’s KSAT12 and KSAT.com. KSAT12 is one of the top ABC affiliates in the country and delivers breaking local news and information 24 hours a day. By delivering more news and information than any other station in town, KSAT12 is set apart from the competition. The KSAT team is known for an aggressive reporting style in our top-rated newscasts and for a daily, fast-paced lifestyle program, “SA Live”, that is number one in the market. With a brand new, state-of-the-art media complex that excites the senses, KSAT12 is just one block away from the nearly 15 mile River Walk, which is lined by shops and restaurants, and The Alamo, one of the most visited tourist attractions in the state of Texas. Jacksonville is big, 500 neighborhoods strong. Twenty two miles of soft sand, warm water, and give you the shirt off your back kind of people. Named 3rd happiest U.S. city to work in… that’s Jacksonville. Proud. Local. Strong. And WJXT Channel 4 has always been there. The station brand, The Local Station says it all. WJXT is the most trusted source for local news and weather in the Jacksonville market, and News4JAX.com is the number one source for local online news. Telling the story of the local community, everything WJXT does is with our viewers in mind. That’s why WJXT has been the market leader for more than 65 years. WSLS 10 is proud to be serving the Southwest Virginia community for over 60 years. WSLS was the first television station in the region, officially signing on the air December 11, 1952. The station broadcasts from a transmitter sitting on top of Poor Mountain in Roanoke County, which has an elevation of 4,041 feet. WSLS was acquired by Graham Media Group on January 17, 2017. WCWJ is the CW Network affiliate serving the Jacksonville-Brunswick, FL television market. CW17 is often recognized as one of the top CW affiliates in the country. In addition to CW network programming, the station is a leader in local sports and entertainment programming. WCWJ launched Bounce Jacksonville on 17.2 in 2011, serving the community with classic movies and programs. WCWJ was acquired by Graham Media Group on January 17, 2017. Graham Digital is a full-service digital agency offering both advertising solutions and technology development. Graham Digital drives and delivers results. The Graham Digital agency provides best in class solutions to effectively optimize your campaign on all 4 screens, and our ability to highly target your customer is limitless. The development team at Graham Digital is made up of dedicated and incredibly intelligent individuals who are passionate about the intersection of digital technology and cutting edge media with experience that ranges from journalism to research, from artiste to artisan. Graham Digital brings a collaborative down-to-earth style to technology development with a love to make the impossible a reality. Social News Desk makes it easy for newsrooms to get the most out of social media with tools built just for them. Leading-edge software lets broadcasters and publishers leverage the latest trends and innovations in social media as they manage all their social efforts from one place and get an advantage over the competition with powerful curation tools, display tools and actionable analytics. Social News Desk, now supporting the social media efforts in over 2,500 newsrooms on 5 continents, makes it simple to discover news and engage audiences with great content. Creative sponsorship opportunities help broadcasters and publishers attract advertisers to monetize social reach. And, best of all, every Social News Desk client is matched with a dedicated social media expert for ongoing support, training and strategy. 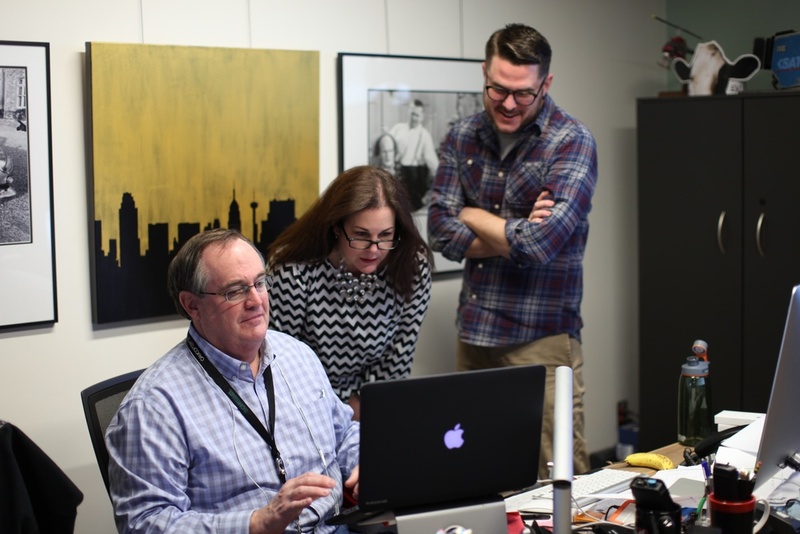 At Social News Desk, we share your passion for news.